If there is an issue Sri Lankans are passionate about even more than politics, it must be cricket. And, if there has been a time when Sri Lankan cricket has been at its lowest ebb since it won the sport's World Cup twenty years ago, it must be now. Last week, it crashed out of the World T20 currently in progress, finishing just above non-test playing Afghanistan in its group. It lost all its group games and survived quite a few anxious moments in defeating Afghanistan. Its performance was hardly worthy of the tag of defending champions. It was the same story a few weeks prior to that when it was able to defeat only non-test playing United Arab Emirates at the Asia Cup, losing to all its Asian neighbours India, Pakistan and Bangladesh. So, what ails Sri Lanka cricket? Is it a lack of talent, a lack of a proper system to harness the talent that is available or political interference in running the affairs of Sri Lanka Cricket (SLC)? Or, is it all of the above to varying degrees at varying times? If anyone cared to look, the writing on the wall was plain to see in the lead up to the World T20 tournament. Lasith Malinga, in his prime arguably one of the best bowlers the game has seen but sadly a tactless individual with a personality style that is as lethal as his famed yorkers, was named as captain for the Asia Cup even though he was only half fit. Malinga played the game against the Emirates but sat out the rest of tournament, watching from beyond the boundary line as his team suffered defeat after defeat. Come the T20 World Cup, it was the selectors themselves who were sacked. A new selection panel was appointed a few days prior to the team's departure to India and were asked to pick a team within 48 hours! They did so, making a couple of changes but retained Malinga as a player and called upon Angelo Matthews, the test and one day international skipper, to captain the team. This is where the cracks began to show publicly. The former chairman of selectors, Kapila Wijegoonewardena made his displeasure known. Matthews, far from being elated at being appointed captain of his country, was as delighted as a man given a rope to hang himself with. "If I am asked to captain, how can I say no?" was his incredulous response. Malinga himself was less than happy. He stated that he could not understand why the selectors wanted him to play when he was only half fit and hobbling. It was not the same kind of enthusiasm that we saw from him when he was playing in the numerous cash rich T20 tournaments around the world. 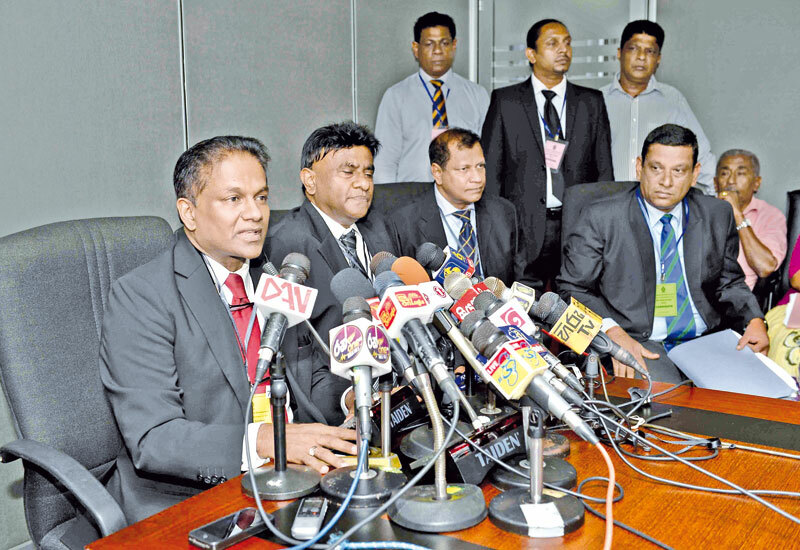 It is also no surprise that all of this followed a few months after yet another acrimonious election at SLC where two factions were fighting for control of the country's most lucrative sport- the Ranatunga faction and the Sumathipala faction. The irony is that both factions are stakeholders in the present government. The eventual winner in this internecine battle, Thilanga Sumathipala is the Sri Lanka Freedom Party (SLFP)'s organiser for Borella. At the last general election in August 2015, Sumathipala polled only 21,810 preference votes and was unable to secure a seat in Parliament. However, he was not only appointed to Parliament on the National List by President Maithripala Sirisena, he was also bestowed with the high office of Deputy Speaker. Sumathipala was to recently question the ethics of former cricket captain Mahela Jayewardena's actions in providing services as an advisor to the England cricket team, when Sri Lanka is due to tour that country in May. Sumathipala does have a valid point, but he himself is under a cloud, still requiring clearance from the Ethics Committee of the International cricket Conference (ICC) which will scrutinise his family's links to the betting industry. Sumathipala's harshest critic, World Cup winning former Sri Lankan cricket captain Arjuna Ranatunga was one of a handful of parliamentarians to support President Sirisena when he walked out of Mahinda Rajapaksa's Cabinet and declared his candidacy at the 2015 January presidential election. Controversial off the cricket field as much as he was on it, he is a leading minister in the government, holding the Ports and Shipping portfolio. Indeed, Sri Lanka's cricket administrators appear to be intertwined in an intricate and incestuous web. Just as much as Arjuna Ranatunga is firmly in the Sirisena camp, his brother Nishantha was with the Rajapaksa camp, heading the Carlton Sports Network (CSN) which is now under investigation. While Nishantha was recently in remand prison as a result of that inquiry, he and Arjuna teamed up to contest the Sumathipala faction at the SLC elections! When a game of cricket was played recently between the World Cup winning Sri Lankan cricket team led by Ranatunga (with the exception of Kumara Dharmasena who is umpiring at the T20 World Cup) and another team of Sri Lankan stalwarts to commemorate the 20th anniversary of the World cup win, President Maithripala Sirisena himself was in attendance but SLC President Thilanga Sumathipala was conspicuous by his absence. Such is the personal nature of the animosity that has infiltrated the ranks of the country's cricket administrators. What is apparent from all of this is that control of SLC has been a coveted objective for the power hungry ever since the country won the World Cup twenty years ago. That there is big money involved, especially in the sale of television rights, is a significant contributory factor to this. So, SLC has hobbled from crisis to crisis, from one Interim Committee to another without a long term vision or plan to uplift the game. The country's cricketers have performed creditably in the post-World Cup victory era largely due to the individual brilliance of cricketers of the calibre of Sanath Jayasuriya, Muttiah Muralitharan, Chaminda Vaas, Mahela Jayawardena, Kumar Sangakkara, Rangana Herath, Angelo Matthews and Lasith Malinga. Their efforts have held Sri Lanka's cricket team together and the successes they have achieved- most notably winning the T20 World Cup just two years ago- have been despite the game's administrators, not because of them. Cleaning the Augean Stables that is SLC is indeed a Herculean task and one that Sports Minister Dayasiri Jayasekera can be expected to achieve. Jayasekera is merely yet another politician and with his tainted history of crossing over first from the United National Party to the SLFP and then from the Rajapaksa camp to the Sirisena camp, he is much lower in the political pecking order than either Ranatunga or Sumathipala. Ironically, an apolitical Interim Committee could have been a solution but the ICC frowns upon such committees because in countries such as Pakistan they could be rubber stamps for their political masters. Therefore the ICC insists on an elected controlling body but the current Constitution of the SLC is such that it has been alleged votes of member clubs can be "bought" by making generous donations from the SLC's coffers. Prime Minister Ranil Wickremesinghe has ventured to suggest that the Constitution of SLC needs to be changed in consultation with the ICC but we haven't heard more details about such an exercise or whether it is happening at all. This point in time- when Sri Lankan cricket is in the doldrums and there is public support for reforms at SLC- might be as good a time as any to initiate such a process and ensure that the administration of the game is left to professionals and devoid of political interference- as it happens in countries such as England and Australia. The government owes that much to the game which, after all, kept the Sri Lankan ethos alive during the dark days of the Eelam war when all that mattered was whether Sri Lanka won and not whether Murali, Mahela or Maharoof was the match winner. The eternal politicking in cricket has to be brought to a halt. Get them out of the game and let the professionals run the game. Politicians are not gentlemen are they as gentlemen do not play politics, but cricket. Lakdev has given a clear analysis of the current issues facing SL cricket. An excellent article which analyses the current issues facing SL cricket. In my view the SL cricket board should have a 5 yr strategic plan to make the SL cricket team the best in the world. This plan has to be monitored by the Sports Minister on six monthly basis to ensure timely achievement of goals. The plan should include a mental training programme to develop mental skills thereby disciplining the minds of individual players. The plan should also include development of the team culture and inter-personal relationships within the team. The Sports Minister may wish to appoint an advisory panel comprising of experts in the field of positive psychology and human motivation. There are several such experts in SL at this moment. Our cricketers are highly talented. The talents are wasted due to lack of mental discipline. All around the world, style of playing cricket has been changed. Simple answer to the problem is Sri Lankan cricket team, selectors and team staff have to be adjusted to such level with new way of thinking.We have no doubt our talents. But, mental and physical preparation was not good enough. Analyzing the conditions and other teams we have to prepare the game with high levels of intensity. Matthews is a good player, but not a captain. He has to go through some dramatic changes with his decision making scenarios. Political turmoil behind the team and SLC board members create worst cricketing era. To solve the problem, everyone has to take their own responsibility.